I became a certified diver in 1972 and took my first underwater photograph in 1973 with a $15 Instamatic camera in a $29 plastic housing. My photographic endeavors since then have won numerous awards in photo competitions and I have become involved in helping others interested in underwater photography by conducting seminars and serving as a judge for international underwater photo contests. I have been diving and photographing over the years at numerous locations in the Caribbean, tropical Pacific and my native California. A current "focus" has been on capturing images of large marine animals. This has taken me to Cocos Island (Costa Rica) and Australia for sharks; the Silver Bank (Dominican Republic) for humpback whales; the Bahamas for wild spotted dolphins; Florida for manatees; San Benedicto Island. (Baja California) for giant pacific manta rays; the Azores (Portugal) for sperm whales; and Patagonia (Argentina) for southern right whales and elephant seals. Other locations visited to pursue my photographic specialty include Fiji, Guadeloupe (FWI), Papua New Guinea, the Philippines, the Solomon Islands, Vancouver Island. (British Columbia), the Galapagos Islands, the Maldives (Indian Ocean), Myanmar (Burma), and Thailand. My images have been used in many books, brochures and posters. Among those using my images for advertising purposes are Reader's Digest and the Holland-America Cruise Line. Magazine credits include National Geographic, National Geographic Traveler, Stern, Popular Photography, Islands, Caribbean Travel & Life, Nature Photographer, National Wildlife, Ocean Realm, and Shutterbug's Outdoor & Nature Photography. Calendars that have used my images include those published by the Audubon Society, The National Wildlife Federation, The Sierra Club, and The World Wildlife Fund. My photos have been on display at aquariums, city and state fairs, and museums (including the Smithsonian). All the images in my portfolio were shot with Nikon 35mm cameras & lenses. Above water, I rely on the F5. 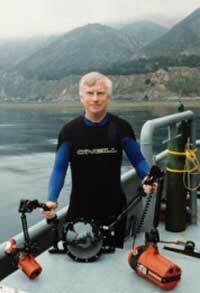 Underwater, I use the amphibious Nikonos III & V cameras, as well as two N90S bodies in Subal (Austria) housings. Lenses (all f2.8) include the 80-200mm zoom (above-water only), the 15mm fisheye (underwater only), a 20-35mm zoom, and 20mm, 24mm, 60mm & 105mm fixed focal lenses. Specializing in marine-related subjects, I market my work via SEA IMAGES, my stock photo agency, and this WEB Site ... http://www.seaimages.org. I am a member of the American Society of Media Photographers and live in San Anselmo, CA.